A recent guests spent five days in Rome before catching the bus to La Mela Rosa. During her time in Rome, she went to the Museo Nazionale delle Arti del XXI Secolo or the National Musuem of 21st Century Arts. It was opened in 2010 and is called MAXXI for short. The shirts (see the photo) are from a newish gallery in rome called MAXXI. The building itself is the main attraction. Most of the exhibitions were fairly ordinary, the shirts were the highlight. 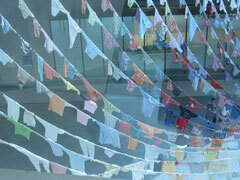 They looked like prayer flags at first glance, it took a while to realise they were kids shirts. There are extensive displays on modern architecture that may appeal to enthusiasts. The outside area of the gallery, however, was really lovely. There were lots of people wandering around, having coffee and kids riding bikes. It seemed like a community area, you only need to pay to go inside.